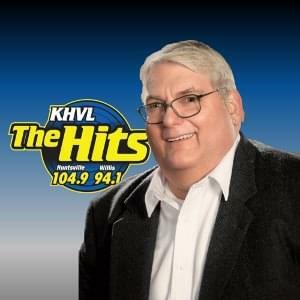 104.9 and now the new 94.1 The Hits is the Southeast Texas home for Good Times & Great Classics! Our Classic Hits genre has the perfect mix of hit music from the 70’s, 80’s and 90’s, with some timeless greats from the 60’s. You will hear the Beatles, Fleetwood Mac, Elton John, Madonna, Hall and Oates, Billy Joel, Sheryl Crow, Janet Jackson, and many more pop icons! We are the soundtrack to your life! KHVL can be heard on three different radio frequencies in Walker and Montgomery counties: 104.9 FM in Huntsville and central Walker County, 94.1 FM in New Waverly, Willis, and Lake Conroe, and all over Southeast Texas at 1490 AM. The Hits can also be heard worldwide via internet streaming at www.ilovethehits.com, and on The Hits streaming app. 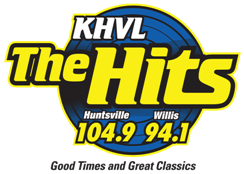 The Hits is purposely local, focusing on the news and events that happen in Huntsville, New Waverly, and Willis. Local daily news, sports and weather forecasts are regularly broadcast on air, online and via social media, as it happens. The Hits is the #1 choice for Baby Boomer, Gen X’ers, and is enjoying a growing Millennial audience! We are actively involved with our advertisers with a staff of creative professionals. Our marketing specialists research the latest business trends to provide our advertisers with the latest business knowledge to succeed. They will assist your business in creating a successful marketing strategy, and then implement that strategy to maximize your advertising budget. Getting you more bang for your buck! The Hits plays more music with less clutter and will maximize your businesses exposure and make an impact with your customers, and potential customers.